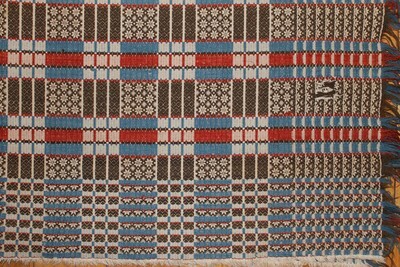 I just added an article about Star & Window coverlets onto my website under the Notebook page with the subpage of PA German Point Twill Related Coverlet Series which you can access via this link: http://www.coverletweaver.com/pa-german-point-twill-related-coverlet-series.html. 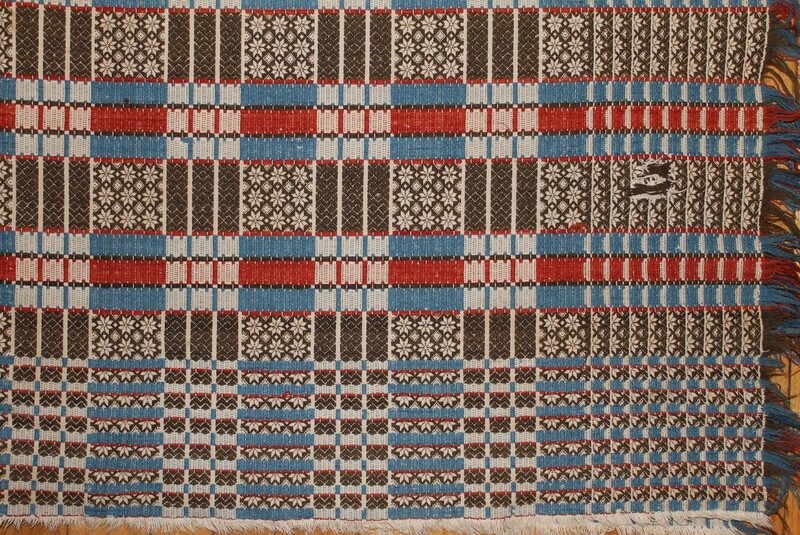 It was originally written for newsletter for the Early American Coverlet Study Group of the Complex Weavers. The Star and Window pattern is one of my favorite patterns which I have not seen very often. It is a combination of the Nine Star pattern and the Window pattern. The lattice like tables are eliminate by both patterns yielding the nine stars and nine window panes. 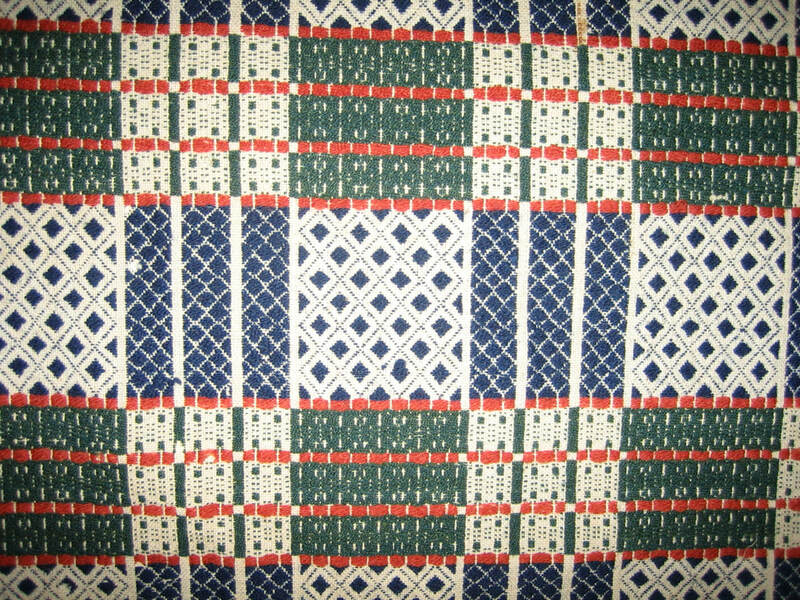 The first time I saw a coverlet in this pattern was at the National Museum of the American Coverlet in Bedford, PA in October 2006. Next, I found the exact draft for it in the Joseph Capp & John Smith manuscripts from Lebanon County, Pennsylvania. 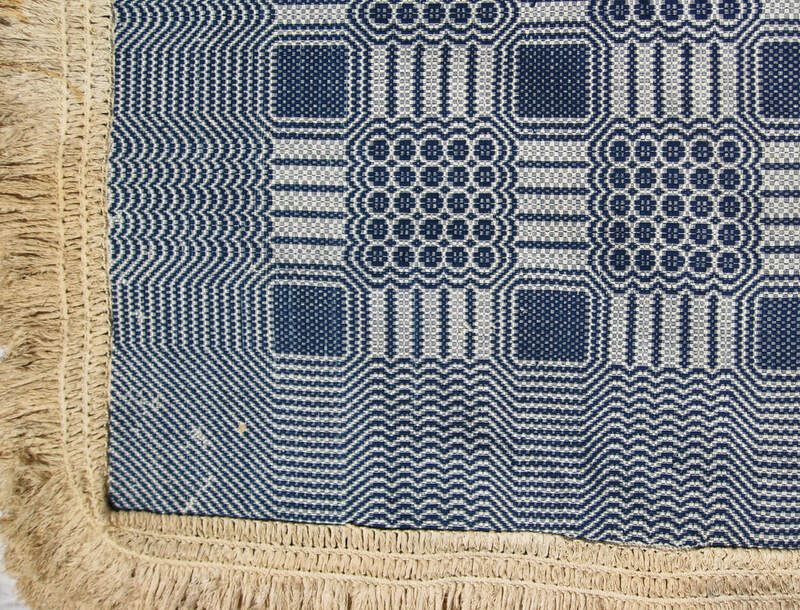 My husband bought the coverlet shown below with the light blue plain weave foundation at an auction in Waynesboro, Pennsylvania in August 2011. 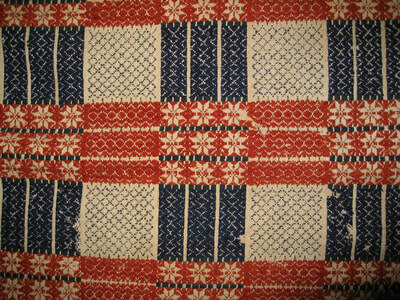 Later that year, right before Christmas, I walked into one of our favorite antique shops in Lemoyne, PA and found the coverlet with the red, green and blue wool with the natural cotton foundation. 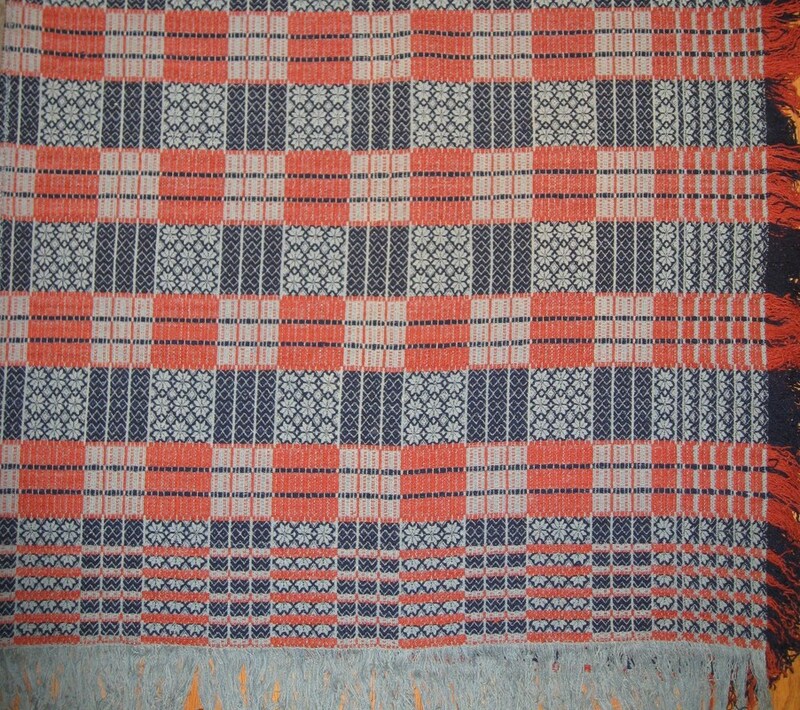 I have woven a small coverlet and a full-size coverlet of this pattern which you can see on my Gallery page at http://www.coverletweaver.com/gallery.html. 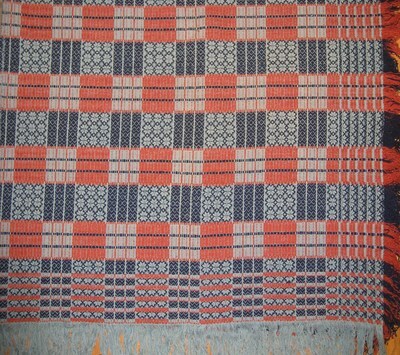 One of the most important design elements of early geometric coverlets is the fringe. It frames the coverlet on three sides and enhances the design of the coverlet. 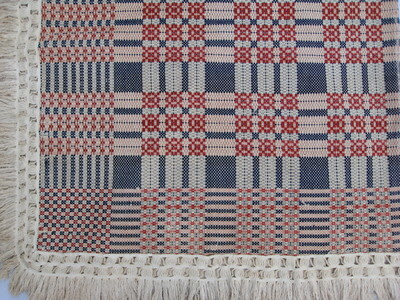 I have found fringe woven with the coverlet and those woven separately and sewn onto the coverlet. Instructions on making the elaborate fringes have not been written, so I have documented how I think they were woven. 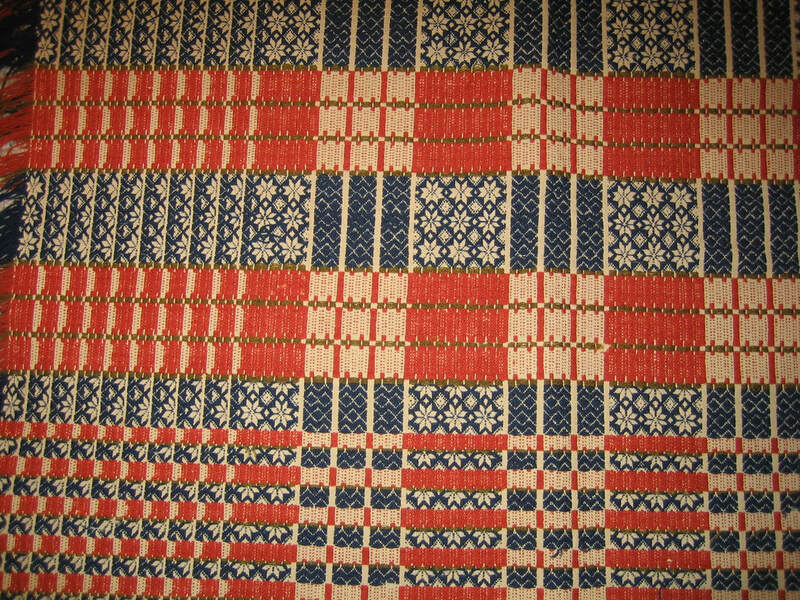 As part of my documentation, I recently wrote an article on fancy coverlet fringes found on early overshot coverlets. My article appears in the First Quarter 2018 issue of the Colonial Coverlet Guild of America (CCGA) Newsletter published by Kitty Bell and Ron Walter. Kitty Bell and Ron have been editors of the newsletter since 2013. They include articles on figured and fancy coverlet as well as the geometric coverlets. 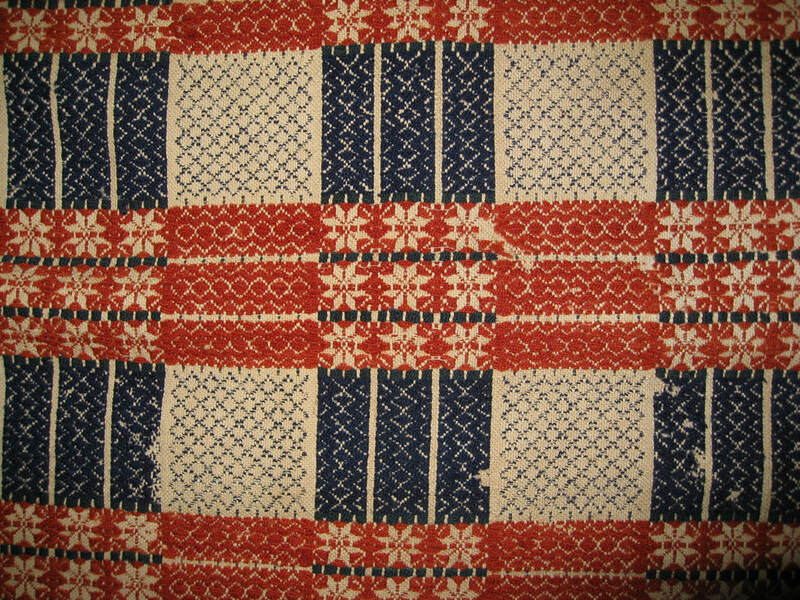 Each issue is filled with photos of both types of coverlets. 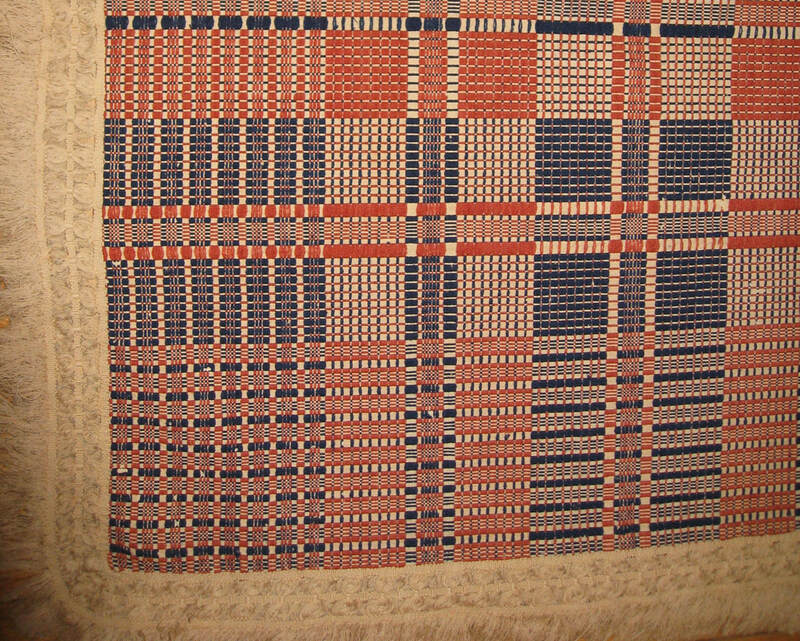 The Guild is a small group of people who are interested in early coverlets. 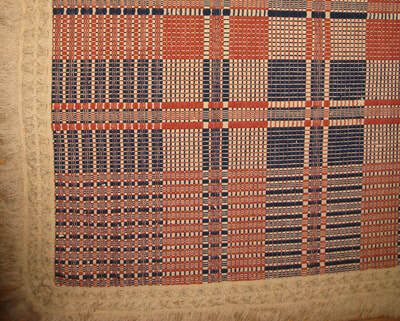 They include coverlet owners, weavers, dealers and collectors. More information along with a membership form can be found on their website at: coverletguildofamerica.org/. My article starts out with my exploration of tied fringe. I have found many versions of this fringe and have also experimented with weaving my own fringe in many different styles (See my gallery website page at coverletweaver.com/gallery.html for my woven examples of “diagonally tied” and “parallel tied”) . 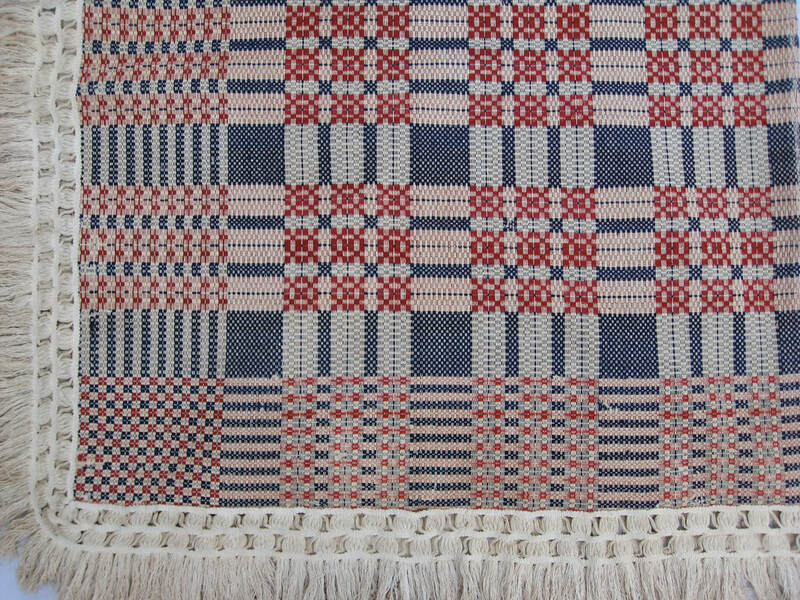 Below are three photos of fancy coverlet fringes also discussed in my article. The first I label “V Shaped” Fringe. The second is “Step” Fringe and the third I call “Very Fancy” Fringe. I have woven samples of all three types with different weights of cotton. 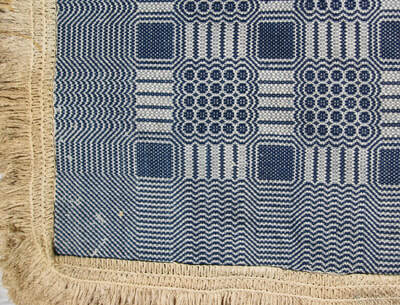 One of my latest coverlets includes a step fringe. I downsized it for my throw-size coverlet/wall hanging. While they take time to weave, it is fun to see the results. I just placed drawdowns of three more of the drafts from Jacob Biesecker’s 19th century Pennsylvania German manuscript on my website at Jacob Biesecker. The first is a star work pattern named “Star and Acorn.” It is not a pattern I can remembered finding in any of the other Pennsylvania German manuscripts. The eight-point star is a symbol of prosperity, while the acorn represents strength. The pattern does require 18 shafts to weave it, but I wove it on my 16-shaft loom years ago by removing a couple of the pattern blocks. The second draft is a classic multi-shaft float work/star work pattern with a diamond motif. It is woven on 7 blocks using 14 shafts. However, if you have an 8-shaft loom you can remove one of the blocks and use 2 shafts for the tie-downs and 6 shafts for the pattern. If you want to try it, let me know and I can figure out a draft for you. A similar diamond draft is found in the Peter Diller manuscript on my website. This is the more common draft using 2 shafts for each of the 8 pattern blocks. Diller names his pattern Baltimore Quilt. 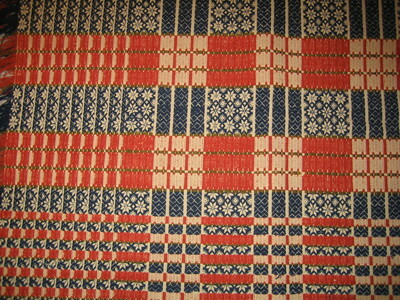 David Bender also has a diamond motif pattern in his manuscript which is also called Baltimore Quilt or Flying Geese. His is the most unusual of the threading systems and his 8 pattern block version only requires 10 shafts. 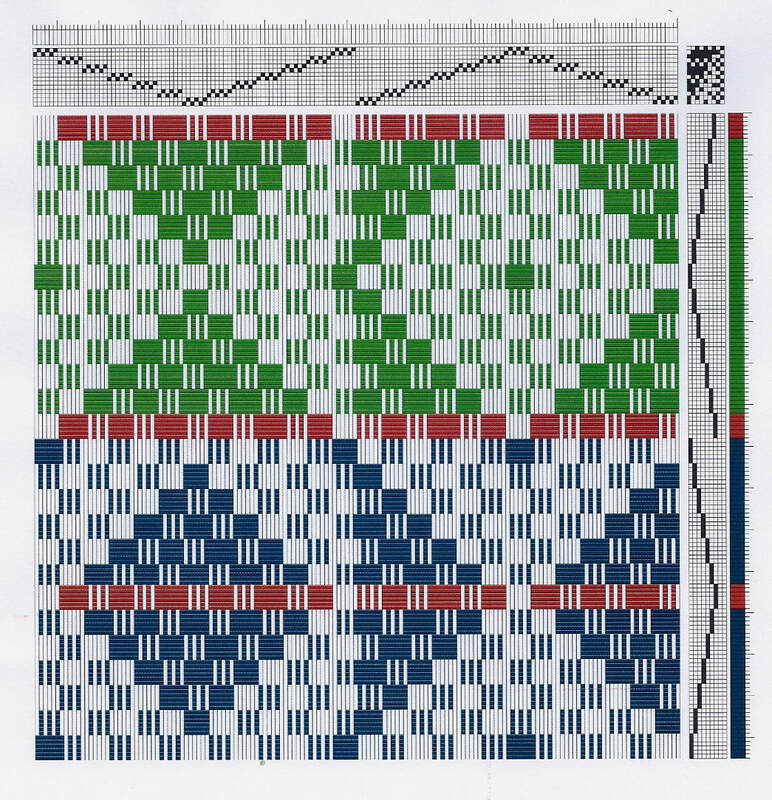 The third drawdown is for a combination weave pattern. 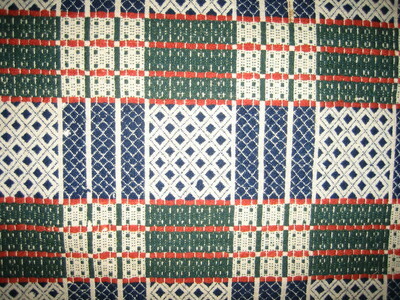 It is called ”combination weave,” since it uses two weave structures, point twill and turned twill. 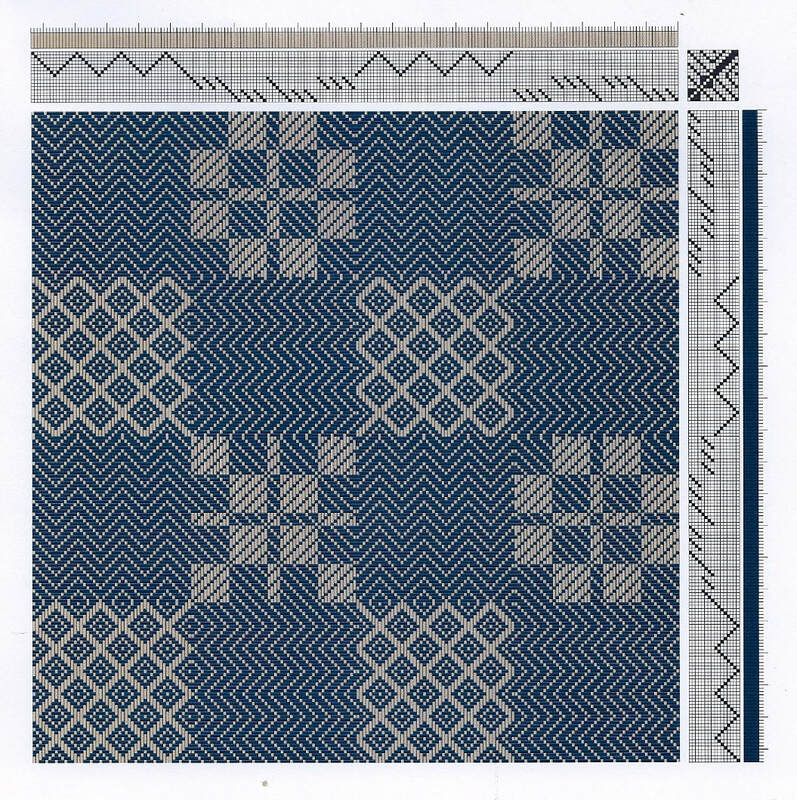 Eight shafts are required for the point twill and 8 shafts are needed for the two-block turned twill star and rose motifs. It fits into the singles cloth category in Christian Frey’s manuscript, because it only requires one warp and one weft.